Part of the Sam Ts project was building a rotating 3D raytraced animation of the company's graphic logo. The original clip art style logo is seen in the upper left which served as a model for the redesign. The Call-to-Action (CTA) graphic featured a perpetual depth-of-field of the new site design. A custom coded feature allowed customers to send an emergency text message directly to technicians in the field. The site's inner pages were bordered with plumbing images like these faucets with running water that were created in Photoshop. 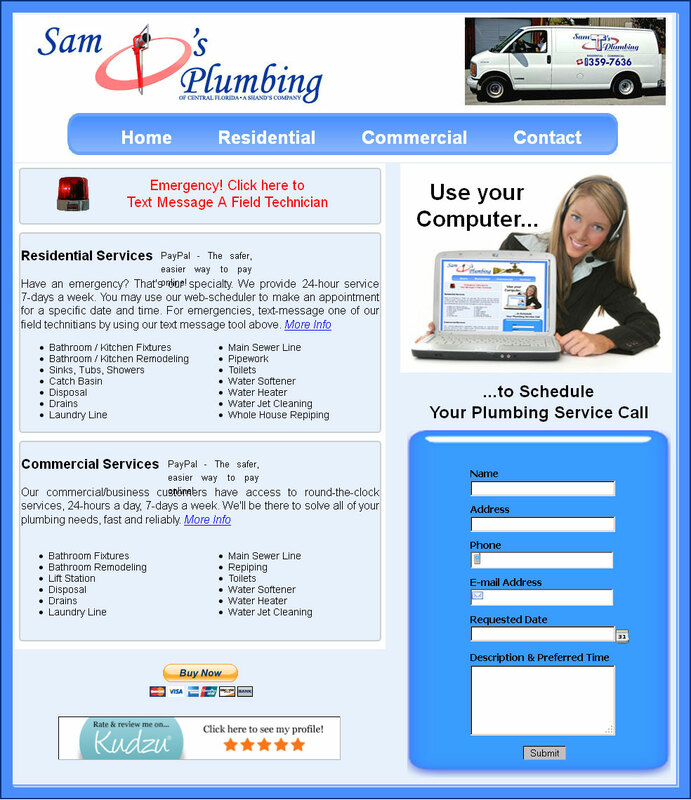 Sam T's Plumbing is a Central Florida plumbing company whose needs did not require a content management system as robust as Joomla, and so I built the site in PHP/HTML. The site only had five main pages, but would host a couple unique features. The first unique component of the site was the custom logo animation. This was a focal point for owner during the consultation phase of the project. The design called for a pipe wrench gripping a pipe in the shape of the letter "T". You can see the final version below. Wireframe models were created in a character modeling program and raytraced producing a hundred or so frames. Those frames were then imported into Photoshop for additional graphical processing. Finally, the sequence was compiled down to a graphical interchange format or GIF and used on the site. Another unique feature of the site was the emergency contact link seen below with the animated emergency light. During consultation, the client expressed a concern for solving a repeating problem with emergency communication with clients. As it were, client calls were directed to the main office and sometimes did not reach the field technicians right away. To address this problem, I custom designed the emergency contact bar as a mini-text messaging system. Clients could use the feature to send emergency messages directly to the technicians in the field alerting them of an urgent need for service. The module was written in PhP and interfaced with a VOIP (Voice Over Internet Protocol) gateway to forward the message to the technicians via their cellular carriers. 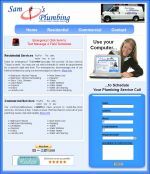 The remainder of the site showcased the company's services and a special section was created for the home do-it-yourself person to fix minor plumbing problems.